A Century of Country is a fresh look at America's fastest growing and most enduring form of popular music, the country sound. Based on the most extensive documentary ever made on a musical genre. The Nashville Network's 13-part television documentary, this beautifully illustrated history provides a sweeping overview of grassroots American show business. Lists of widely loved country hits and capsule biographies of country's Hall of Fame members enrich the text as it moves through its 100-year story. Vintage photographs, rare artifacts and penetrating portraits provide vivid illustrations, many of which have never been published before. From the ballads of Appalachia to the honky-tonk laments of Texas, from the lyrics of the singing cowboys to the breakdowns of bluegrass pickers, from the raw rebellion of the rockabilly acts to the heart songs of the Nashville crooners. A Century of Country is a panorama of styles, stars, and images. Colorful anecdotes, historical incidents, and personality quirks intersperse a narrative that takes us from the mists of Appalachia at the turn of the last century to the neon-bright marquees at the turn of this one. Artists in these pages such as Willie Nelson, Shania Twain, Roy Rogers, Hank Williams, Johnny Cash, Garth Brooks, Bill Monroe, Elvis Presley, Dolly Parton and Kris Kristofferson are passionate, vibrant, creative forces who have become international stars. No previous book has told country music's story the way that A Century of Country does. No other book has had its sheer scope - 100 years of stories, recollections, humor, sadness and wisdom of the style's greatest stars. In our journey from cowboy campfires to concert halls, we hear how this music takes the pulse of our nation like no other art form. Author Robert Oermann and the stars in their interviews break new ground by telling stories that have never before been put in print, including the development of country music on television. This music reflects the restless pioneer spirit of America as well as its ongoing demand for innovation, change, and progress. Its lyrics speak to us about the cowboy, the housewife, the hobo, the laborer, and the teenager. Its themes are as universal as hope, faith, love, betrayal, blues, and patriotism. And within its boundaries can be found such diverse personalities as Linda Ronstadt, Elvis Presley, Woody Guthrie. The Eagles, Gene Autry, Jimmie Rodgers, the Carter Family, LeAnn Rimes, and the Dixie Chicks. Superstars from Bob Dylan to Ray Charles have drunk as its well-spring of inspiration. Indexed, there is hardly a musical form that has not been influenced by the country sound. A Century of Country is a highly personal journey concerning real stories, real people, and real life. It looks backward to show how this multimillion-dollar entertainment form has drawn so much of its strength and resilience from its rich heritage. Country music is as old-fashioned as wax recordings and as modern as the Internet. It has always been part of America's cultural fabric and it always will be. It tells us so much about who we are as a people. It is the story of our past and the mirror to our future. It is, in a word, ourselves. Dubbed "the dean of Nashville's entertainment journalists", award-winning Robert K. Oermann is a multi-media figure in Music City. As a TV personality he is seen on TNN and many other networks. He is the editor-at-large of Country Music magazine, a columnist for the Music Row trade periodical, and a feature writer for The Tennessean. This is his sixth book. Among his prior titles are America's Music (1996), Finding Her Voice (1993), and The Listener's Guide To Country Music (1983). He is also a writer/producer for television whose scripts include specials for stars such as Vince Gill, Conway Twitty, Billy Ray Cyrus, and Dolly Parton, as well as regular programming for the CMT video channel. Oermann's honors include the Nashville Music Award (1996), a CMA Award (1988), ASCAP's Deems Taylor Award (1994), and the SESAC Journalist Achievement Award (1983). He served as the historical consultant for CBS News Productions throughout the creation of the 13-hour "Century of Country" series. 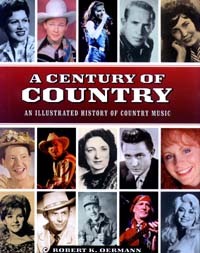 A Century of Country is based on the original 13-episode series, "Century of Country", as seen on TNN.